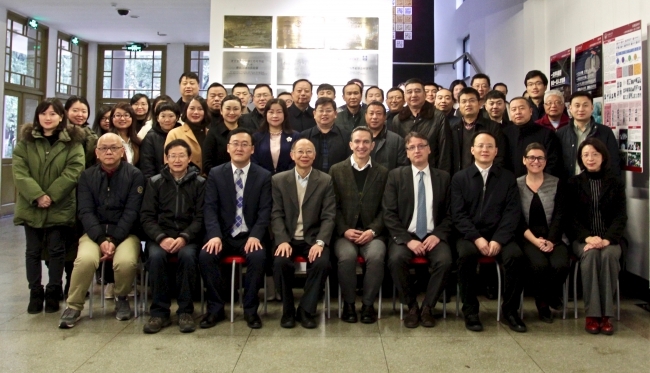 On January 11th, the conclusion seminar of UNESCO “World Heritage and Sustainable Tourism” China Pilot Studies (“World Natural Heritage Wulingyuan Scenic and Historic Interest Area” and “World Cultural Heritage Tusi Sites- Guizhou Hailongtun”) was held in WHITRAP Shanghai. Peter Debrine, UNESCO World Heritage Centre Senior Project Officer, Simone Ricca, Deputy Director of WHITRAP Shanghai, Marie-Noel Tournoux, Project Director of WHITRAP, Prof. Xiao Qianhui from Department of Tourism, Fudan University, Prof. Yan Guotai from College of Architecture and Urban Planning, Tongji University, Mr. Tang Yibo, CEO of Shanghai Torlax Travel Network Technology Co., Ltd, and 30 officials led by Mr. Zheng Xiaohu, Chief Executive of People’s Government of Wulingyuan District and Mr. Zeng Zheng, Chief Executive of People’s Government of Huichuan District, as well as research team members attended this seminar. The team leader, Prof. Han Feng from College of Architecture and Urban Planning, Tongji University, presented the two pilot studies in terms of the research background, objectives, framework, methodology, current issues and suggestions, followed by a lively discussion among experts from different areas, which also proposed valuable opinions and suggestions. The experts thought the design of the research was detailed and reasonable; the objectives were clear; the investigation was thorough and in-depth, integrating opinions from experts in various fields and different groups of stakeholders; the issues found in this research were precise- they were not only very representative of World Heritage Sites in China but also a reference for the global common issues of World Heritage and sustainable tourism. All the experts agreed that the WH+ST China Pilot Studies passed the review.